DETROIT — Comerica Park underwent quite a transformation over the past week, from a concert venue to a baseball stadium to a soccer pitch. In its latest form, the park hosted a 2-1 win (penalty kicks) for Paris Saint-Germain over AS Roma in an exhibition game on Wednesday. 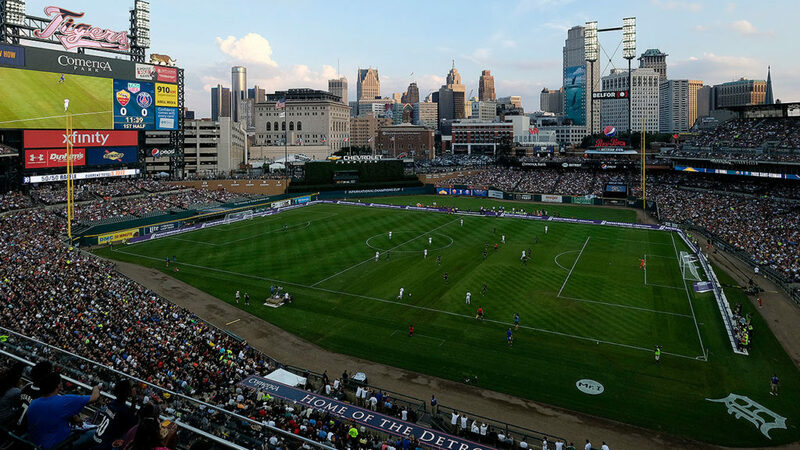 It was the first professional soccer match in the history of Comerica Park, which opened in 2000, and part of the fifth-annual International Champions Cup, a tournament of pre season friendly matches between European clubs. The tour has stops in 11 U.S. cities (of which Detroit was the first), as well as in China and Singapore. Comerica was the venue for a Metallica concert on July 12, then hosted three games between the Tigers and Blue Jays from Friday to Sunday, before Roma and PSG played Wednesday. The goals were set up in left field and behind the first-base line. The pitcher’s mound was lowered and covered with grass, as was the rest of the infield, while the warning track surrounding the field remained uncovered. Roma has a history of playing at baseball stadiums, having won at Busch Stadium last year and Fenway Park in 2014 and ’12. PSG is the two-time reigning champion of the International Champions Cup. A general passion for soccer was evident among those who attended, which is a positive sign for Detroit as it vies for an expansion franchise in MLS. Detroit, which has a fourth-tier pro team, Detroit City FC, is one of 12 cities vying for four spots in MLS’s long-term expansion plan.